Spring in Wallowa County always keeps residents, and visitors, on their toes. Is there going to be wind, rain, snow, sun?? Yes, yes, to all of those, and sometimes in the same day. But, other than the certainty that the weather is going to be uncertain, there is another constant during the spring, BABIES! Here on the ranch from mid April until about June, we have calves joining the ranks. And, to state the painfully obvious, they are adorable! Reddish/tan in color, furry in texture, what’s not to love?! In addition to being cute, these little ones are pretty amazing little creatures! Entering the world at approximately 45 pounds, they are keeping up with their mamas within a couple hours of being born. And considering that bison can reach speeds up to 40 mph, I would say that is very impressive! Fortunately for our calves, their required mobility is primarily aimed at following their mamas when traveling to water or grazing, and the occasional pasture move. In the video you can see that not only do the calves have no problem keeping up in the pasture move, they are leaders of the pack! The gestation period of a bison is equal to that of cattle, approximately 283 days, or about 9 ½ months. However, beef calves are on average about 20 lbs heavier than bison calves. Which is most likely attributed to the fact that cattle have been domesticated and have a long history of humans influencing their genetics, bison however have not and are closer to their natural body compositions. These smaller calves bring one MAJOR benefit (and one of our personal favorite facts about the bison): they do not require any maintenance or help during calving! And, to be completely honest, if they did require help, they would not accept it. As bison do not have the history of domestication that cattle do, their personalities and nature are still quite wild. This generally puts them in a fight or flight mode a majority of the time when people are around (unless of course the hay truck is involved). So, if we were to assist during calving, they would put up the defense and we would most likely end up in the hospital, or they would exhaust themselves in an attempt to get away. Which, leads us back to no maintenance, and us not losing any sleep during calving season! Another aspect of calving season that we occasionally deal with are bottle babies. Although twins are relatively uncommon with bison, they do come along from time to time. Unfortunately, bison are not particularly good at being maternal and attentive towards multiple offspring, and when twins do come along it is very common for one of the twins to get abandoned. When this happens, we take them home and, much to our dogs' displeasure, let the calf/calves call the yard home throughout the summer and fall (thank goodness for good chain-link fencing!). While these little ones are residents of the yard, they get fed a diet of lamb milk replacer (lamb milk replacer has a higher fat content than calf milk replacer) for about four months and then we begin the process of weaning them off the milk. After these guys graduate from the yard, they are introduced back into the herd. Some of the very first bottle babies that we had (20+ years ago), Annie and Rosie, became permanent residents of "The Slope" and acted as our slope herd leaders; Rosie is still around, Annie passed away several years back. Although bottle babies can be A LOT of work, they can be very beneficial to herd dynamics, as we found with Annie and Rosie. Having animals in your herd that are more comfortable with humans keeps your herd calmer and a little more manageable. 1. Bison is the term that people and companies in the food industry use and it is important to us to stay properly aligned with them. 2. Bison and Buffalo (Cape & Water) are completely different animals and we think it is important for people to begin to make that distinction. Slowly but surely we will be making this change to all of our online accounts, merchandise, and signs around town (this one may take a little time). Thank you for understanding our new change and recognizing that although we have a new name, the same people and great product are still behind it! Below is a link to an interesting article that discusses the different between Bison and Buffalo. 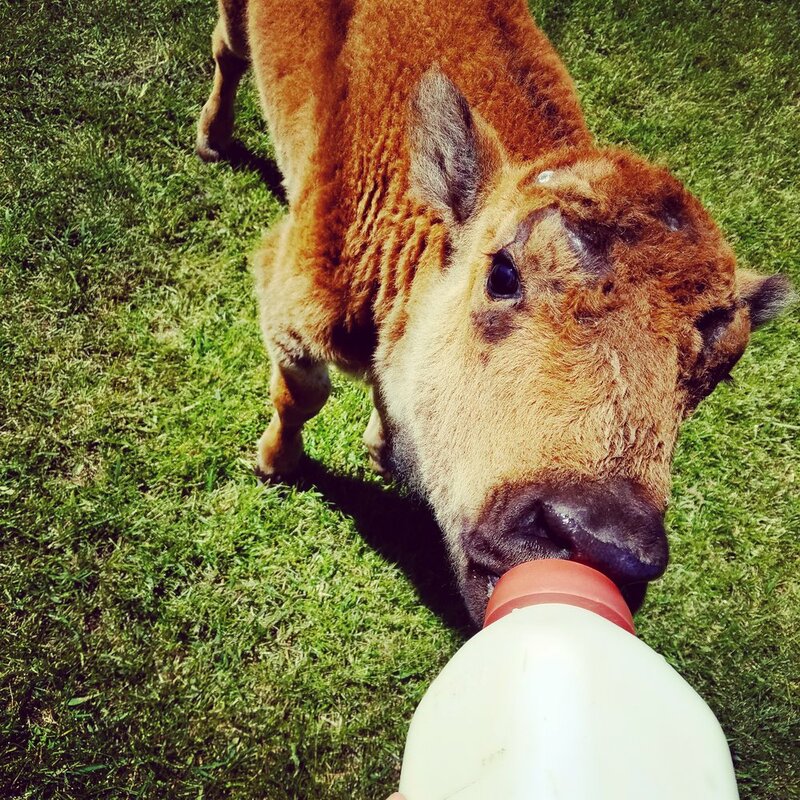 Thank you so much for visiting the Stangel Bison Ranch website! We are very excited to have it up and running. On this section of the site we will be posting our "ranch happenings," which will mainly comprise of news, what's going on, or anything we might think our customers may find interesting or want to know about us!